In Stock. 7-10 working days. The Prince T22 shoe is built on the foundation of the proven T Series with a performance and feel of the T10. Adding mesh to the upper, the T22 has improved the ventilation while maintaining durability and support. The TPU forefoot straps lock the foot in place ensuring excellent support and forefoot stability. The injected wYshbone TPU shank helps keep the foot stable during lateral movement. Prince backs the T22 with a 6-month durability guarantee. Fit: Length fit runs true to size. Width fit is medium. Arch support fits lower than medium height. Offers a comfortable ride with no break-in required. 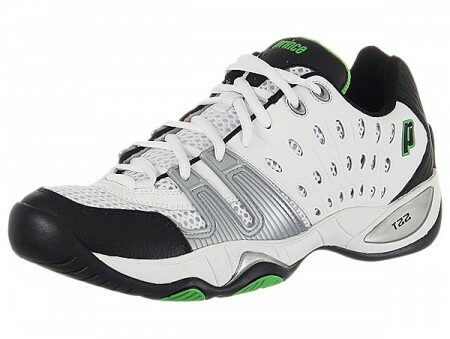 Upper: Breathable, synthetic upper enhances comfort and flexibility. Mesh panels allow for breathability. Midsole: EVA Midsole with ShockEraser heel insert absorbs shock while SoftSpring PU forefoot insert disperses shock to enhance comfort. Outsole: PRC 1000 durable outsole compound in a herringbone tread pattern provides durable traction on all surfaces. Like regular street shoes, tennis shoe size is based on the length and width of your foot. Determining your proper shoe size is essential to a comfortable fit. The following measurement tips are valuable aids in getting an accurate reading of your own feet. Further down, you’ll also find a men’s Tennis shoe size chart. If you already know your Tennis shoe size, we recommend that you skip this process and order the size that you normally wear. If the shoe has a different fit, it will be noted on the product page. Tennis Shoe size that are too small are one of the major causes of foot pain and problems. Tennis Shoe size that are too large can cause blistering and a lack of stability. Don’t assume your tennis shoe size is the same as it always has been. The shape of your feet changes over time. Take your measurements to determine the Tennis Shoe size at the end of the day, when your feet are the largest. Wear the socks you’ll wear with your new shoes when you measure the Tennis Shoe size. Measure both feet and fit shoes to the larger foot. If you are doing the measurement by yourself, you will get more accurate resultsif you sit in a chair when measuring. Don’t stand. If you have someone to help you take your foot measurement, standing is the best choice. You may take measurements in inches or centimeters. To convert inches to centimeters, multiply inches by 2.54. While seated, place your foot on a piece of paper in front of you. With a pencil, trace around your foot. Hold the pencil as straight up-and-down as possible while measuring and be sure that your pencil remains in constant contact with your foot during this process. 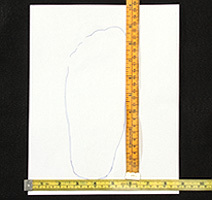 With a ruler, measure your tracing to determine your foot length and width to determine your Tennis Shoe size. To find your foot width, measure the distance between the two widest points on your tracing. Reduce this number by 5 mm, or 1/5-inch. The result is the number you will use to determine your foot width. Use the chart below to determine your width. Make sure you are looking in the proper column, either men’s or women’s, when determining your size. The standard width for women is B. The standard width for men is D. *Note: This chart is here to give you a general idea on sizing and widths. iTennis is not responsible for mismeasurements or ordering the wrong size. We recommend that you order the size that you normally wear in other shoes. Just received my shipment of the Wilson BLX Pro Lite racquet. It was an extremely friendly and helpful experience on this new site of Itennis, where I was guided by Mr Sree Kumar through a live chat. The service was prompt and it took 48 hours to reach Gurgaon from Bangalore. I am very impressed with the overall experience from browsing to ordering. Would like to thank the guys at iTennis. The online order went through without any glitch and I received the product within 24 hours from Ordering. You guys rock!! Looking forward to buying from you guys.